"Confirming rumors that have been circulating for a week, on Monday Apple began inviting the press to a media event for September 9th. As with other media event invitations the company isn't offering details on what will be included, but the image accompanying the event is iPod-themed, with a tagline that reads, 'It's rock and roll, but we like it.'" "Consumers in the US may get their wish and see the iPhone available on a number of wireless carriers, if one analyst's prediction holds true. "Gene Munster, senior research analyst at Piper Jaffray, believes that Apple will transition to the multiple carrier model within the next year. This is most likely next summer, a time when Apple typically introduces new models of the iPhone...."
One of the advantages of working at home is that I can watch ABC's The View, to which I confess a bit of an addiction. I usually don't watch it off air, as I'm busy working at that time of the day, but I tape it for time-shifted viewing, and I'm a big fan of Whoopi Goldberg. I frequently disagree with Whoopi's politics, being more in harmony with Elizabeth Hesselbeck's perspectives, but I enjoy Whoopi's commentary and repartee. She's much more of a thoughtful philosopher than one would have imagined from her acting and comedy personas. Who knew? Anyway, it appears that Whoopi, while being something of a tech skeptic, likes iPhones, having been photographed back in June 2007 by iPhonity.com buying one of the original iPhones, and Contactmusic.com reported, with photos, that she was so determined to get her hands on the then new Apple iPhone, she queued outside with thousands of gadget fans at the official unveiling. Then more recently by Contactmusic.com leaving the SoHo Apple Store in NYC with another iPhone, even though, she's been plugging the HTC myTouch 3G and Touch Pro2 from T-Mobile in a commercial. Coolspotters.com also has posted a photo of Whoopi with the iPhone. So, is Whoopi still an iPhone fan, or has she cooled on the iPhone and become a T-Mobile user (or both) in real life? "The International EMF Collaborative released a report to draw attention to studies linking brain tumors and cell phone use and debunking the findings of the Interphone studies. The report emphasizes dangers of cell phone use by children and teens and recommends awareness campaigns." CTV reports that drivers in the Canadian province of Saskatchewan may soon be legally obliged to eschew using handheld cellphones while driving and put both hands back on the steering wheel and their minds back on what they're doing. The report says Saskatchewan Premier Brad Wall announced Tuesday that the province will introduce legislation this fall that would ban the use of handheld electronic devices to text or talk while operating a vehicle. Wall is quoted commenting that, "The information that's coming in is irrefutable. We know that if you're texting, from a study out of Virginia, you're 23 times more likely to be in an accident . . . It's a serious issue." PR: More than 66% of Americans are considered overweight or obese by the National Center for Health Statistics. To help defeat this overwhelming problem, the doctors of the Scottsdale Weight Loss Center (SWLC) PLLC announce the launch of FoodGauge, a new smart phone application for iPhone, iTouch, and BlackBerry that helps people get on the right path to weight loss by taking the guesswork out of confusing nutrition labels. Gone are the days of wondering whether that bag of chips is good for you. Developed by Robert Ziltzer, M.D. and Craig Primack, M.D., top weight loss physicians and cofounders of the SWLC, FoodGauge takes four factors into consideration: fat, carbohydrates, fiber and protein. By simply entering this information into the application from the back of any nutrition label, FoodGauge provides a numerical score, ranked from five to one, that helps you choose which foods will assist with weight loss. "Weight loss does not have to be rocket science," said Dr. Ziltzer. "Using the principles of sound nutrition and our background as certified weight loss doctors, we have created FoodGauge to simplify food choices for the average person." Fruits, veggies and lean meats (foods that are healthy and keep you full) will rank a four or five and can be consumed relatively guilt-free. Food that scores a two or one is generally full of sugar, butters and oils (empty calories that cause you to desire more empty calories) and should be eaten sparingly. "Many people think technology makes us lazy," said Dr. Primack. "Dr. Ziltzer and I choose to embrace the tools at our disposal, such as the iPhone and BlackBerry, and make them useful. Having a program in your pocket that assists with weight loss is very appealing to those who struggle with discerning between good and bad foods." Available for 99¢ through Apple iTunes and $2.99 through BlackBerry App World, FoodGauge is a convenient, inexpensive application for people looking to be more knowledgeable about their food intake in pursuit of shedding those pounds. Scottsdale Weight Loss Center (SWLC) is a medical weight management center providing comprehensive weight loss programs to the residents of the Greater Phoenix area. Founded by Craig Primack, M.D. and Robert Ziltzer, M.D., SWLC provides physician-supervised weight loss programs that include strong coaching support and education to promote lifelong solutions for managing your weight. Since 2006, SWLC has helped clients lose more than 55,000 pounds. 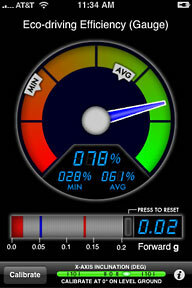 PR: Williamsburg based Hunter Research and Technology announces greenMeter 2.0 for iPhone and iPod touch. greenMeter computes a vehicle's power and fuel usage characteristics to help drivers increase efficiency, reduce fuel consumption and cost, and lower environmental impact. Results are displayed in real time while driving, to provide instantaneous feedback, and can be shown with US or metric units. Version 2.0 adds three new eco-driving efficiency displays. Hunter Research and Technology announces the immediate worldwide availability of greenMeter 2.0 in the iTunes App Store. greenMeter computes a vehicle's power and fuel usage characteristics to help drivers increase efficiency, reduce fuel consumption and cost, and lower environmental impact. Using data from the device's built in accelerometer, greenMeter calculates horsepower, miles per gallon, annual fuel cost, crude oil consumption, and carbon footprint. Results are displayed in real time while driving, to provide instantaneous feedback, and can be shown with US or metric units. Because greenMeter uses a novel algorithm that integrates and visualizes data over the entire speed range, the app does not require GPS, thereby enabling usage on all generations of iPhones and iPod touches. In version 2.0, greenMeter adds three new eco-driving efficiency displays: glowing leaves that change color from green to red, an analog gauge similar to real vehicle instruments, and an LED-style bar graph like the type used in many hybrid vehicles. greenMeter 2.0 also comes with a new "easy setup" option to help users specify vehicle characteristics. Originally launched in September 2008, greenMeter has been purchased by users in over 60 countries around the world. The app can help a typical driver reduce environmental impact and save hundreds of dollars in fuel expenses every year, but its overall global impact is even more important. "Based on a conservative estimate of worldwide use in its first year, greenMeter has likely saved about 2 million gallons of gas, reduced fuel expenses by over $5 million, dropped oil consumption by nearly 20,000 barrels, and prevented almost 47,000 tons of CO2 from entering the atmosphere," says Dr. Craig Hunter, the greenMeter developer. greenMeter 2.0 works on any iPhone or iPod touch running iPhone OS 2.2.1 or later (including iPhone OS 3.0-3.0.1) and is available for $5.99 on the iTunes App Store. More information, including screenshots and demo videos, is available on the Hunter Research and Technology website. Media professionals interested in reviewing greenMeter can request a promotional code to download the app from iTunes at no cost. PR: idealius.com introduces LookItUp! 1.0 (Búscalo! 1.0 for its Spanish version), their new search engine utility for iPhone and iPod touch. Developed specifically to leverage the iPhone's unique abilities and interface, LookItUp! offers a radically improved approach for searching anything. LookItUp! aims to be the most comprehensive search engine of search engines. From a single search, gain free, instant access to millions of pages from hundreds of search engines. Users can find exactly what they want by tapping into thousands of company websites, job boards, newspapers, images, audio, video, articles, blogs and associations. It's the perfect tool to drill down by keyword, site location as well as by filtered search. "I was tired of having to jump around from one search engine to another, particularly from my iPhone" said Carlos G. Varela, CEO and founder of idealius.com "With LookItUp! in the palm of your hand, now anyone can search all these thousands of sites at the same time, on one simple search, returning last minutes info." LookItUp! features hundred of relevant search engines, including A9, ABC, Accoona, AltaVista, Amazon, Ask, AskJolene, Atomfilms, FAST, Alltheweb Image, BBC News, CareerBuilder, CNN News, dmoz Open Directory, ezinearticles, Findarticles, FoxNews, goarticles, Google, Google Blog Search, Google Images, Google Video, MSN, MSN Images, PicSearch, Reuters, Technorati, Truveo, Yahoo!, Yahoo! Audio, Yahoo! Jobs, and Yahoo! News. LookItUp! 1.0 for iPhone is 99¢ (0.79 Euro) and available exclusively through Apple's App Store. There are US iTunes Store's Promotional Codes for Press Reviewers that can be obtained upon request. PR: ePapyrus Inc. launches powerful new PDF reader, "PDF-Pro for iPhone and iPod touch" in The Apple App Store. ePapyrus Inc. has introduced one of the most powerful iPhone/iPod touch PDF readers through The Apple App Store. The reader, named "PDF-Pro for iPhone & iPod touch" immediately sold almost 100 copies while it was launched in The App Store. PDF-Pro is built on the powerful and proven PDF engine from ePapyrus Inc. that has been marketing its PDF products worldwide. Not only can it handle single-byte character languages beautifully, but it can also read double-byte character languages such as Korean, Japanese and Chinese. It also supports the password input window so that if you know the correct password of an encrypted PDF document, you can always open that encrypted PDF document with ease. You can also lock the default auto-rotation function provided by The iPhone and iPod touch to prevent unnecessary oscillation of your PDF document while viewing it. PDF-Pro also supports other standard PDF reader features such as creating and editing folders, bookmarks and zoom in/zoom out functions. ePapyrus continues to add new products to its lineup for the worldwide market and "PDF-Pro for iPhone & iPod touch" is the latest addition. Currently there are only about 30 other mobile PDF readers in The Apple App Store, however The ePapyrus PDF-Pro reader provides some of the best functionality. Mr. Jeong Kim, CEO of award-winning ePapyrus Inc. adds, "We are very excited to launch a top quality mobile PDF reader for The iPhone and iPod touch, based on our cutting edge PDF technology that has been proven in the worldwide market. We will do our best to continue to upgrade our PDF-Pro mobile reader to exceed the high expectations of all iPod touch and iPhone users." PDF-Pro can be downloaded directly through iTunes and the price is $4.99. PR: ANDESigned releases version 1.2 of Total Baby for iPhone and iPod touch. In addition to the new Backup/Restore/Transfer feature previously released, which ensures your important data is safe and sound or lets you move your data from one iPhone to another; Version 1.2 adds an array of new updates that continues to make Total Baby the "Must-have high-tech accessory for Parents." Version 1.2 adds: Solids support: Quickly add solids by selecting multiple items from a list of 55 built in solids that dynamically change based on the age of your child. Time/Date editing by Duration: In addition to changing the start or end date of a timed event, you can now simply choose the duration to make manual entry and editing a snap. Change Active Timers: You can now change the start time of an active timer to adjust for life's uncertainties. Total Baby will help you log and time all aspects of your child's care through a smart and sleek interface that makes tracking easy and fun. Inspired by my own family, I built this application from the ground up to support multiple children (especially twins) with "unmatched features on any computing platform." Total Baby combines 12 separate timing and tracking functions into a single complete solution. Total Baby will help answer important questions, such as "How old was my child when they had their DTaP shot?" and "When was the baby's last feeding or doctor visit?" Feature Highlights: Main Screen Complete summary of your child's day grouped by time (Early Morning, Morning, Afternoon, and Evening) The amount of time since the last timed start or end date (selectable via preference setting) for each event Your child's current age, days until their next birthday, and their most recent photo Edit or Delete any entry without leaving the main screen Change the start time of an active timer Jump to any date or tap the "Export Data" button to: Export your data via Email; Use the Backup/Restore functionality to backup all your data for safe keeping, and/or transfer this data to another iPhone using local WiFi and your computer's browser. Timers (All timers will automatically stop in case you get too busy to remember to turn it off) Diapers Feeding (Nursing/Bottles/Solids - fluid and solid selection dynamically changes based on the child's age) Sleeping Bath Time Other (Create your own timer or single events like Medicine or Temperature) Entries (The baby's age is shown for every entry) Diary and Milestones (Add photos with the built in camera or use previously saved photos) Doctor Visits (Grouped by Past and Future Appointments) Growth (Show Percentages of change for Weight, Length, and Head Circumference) Vaccines (Preloaded with vaccine description and information) Total Baby includes 129 built in descriptions and timer events to get you started, these are fully customizable and you are able to create your own. All Entries have a note and title field and all Timers have a note and fast description picker to quickly add repetitive information such as where your baby slept or how you held the baby during nursing. Support for 6 children with an innovative dual timer display which automatically detects twins or multiples (via a preference setting). Promotion of proper alternate side nursing with both visual cues (safety pins) and automatic Start (alternate) side functionality. Automatic conversion between all Units: Bottle: mL & oz Weight: kg, lb, & lb + oz Length: cm, in, & ft + in Export data via email, in a simple and easy to read table grouped by day. Backup/Restore/Transfer over local WiFi with a computer browser. Use this feature to restore the backup to the same iPhone or transfer from one iPhone to another. Ability to enter in the Expected Due Date of your child so you can start using Total Baby before your little one enters the world. Total Baby will show the amount of days left till the baby is born. Total Baby for iPhone and iPod touch is $4.99 and available exclusively through Apple App Store. PR: Vonage has announced that Apple approved its mobile application for iPhone and iPod touch. Vonage is currently conducting a beta test and general availability will be announced at a later date. This new service, along with the recent launch of the Vonage World unlimited calling plan, continues Vonage's heritage of using innovative technology to create significant value for its current and future customers. PR: AdHouse Books will be pre-releasing the first "issue" of FCHS, a comic book series described as "Archie meets 90210," through the Comics by comiXology app for iPhone and iPod touch during the Diamond pre-ordering period. FCHS is available today for Comics by comiXology, while the print edition will hit retail stores in November. For the first time, a comic book publisher will be offering a free digital preview of its soon-to-be-released graphic novel through the Comics by comiXology app for iPhone and iPod touch devices. AdHouse Books will be pre-releasing the first "issue" of FCHS, a comic book series described as "Archie meets 90210," through the Comics by comiXology app during the Diamond pre-ordering period, and the Diamond pre-order number will be prominent in the app. Comics by comiXology's retailer locator will enable customers to contact local retailers from within the app itself to order the comic. "We enjoy our close relationships with indie publishers, and believe our Comics by comiXology app is the ideal way for them to increase the exposure to their titles that may otherwise not receive the attention they deserve, while increasing sales of the print editions once they become available," said David Steinberger, CEO of Iconology, creator of the Comics by comiXology app. 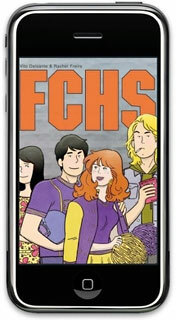 FCHS is available today for Comics by comiXology, while the print edition will hit retail stores in November. "I'm very excited for this opportunity," said FCHS co-creator, Vito Delsante. "A lot of folks didn't get to see the Free Comic Book Day comic, and this is a perfect opportunity for those folks to not only read that, but 12 extra pages from the first chapter!" "I welcome the opportunity to work with comiXology in a new way to spread the advance word about our upcoming Fall release of FCHS," says Chris Pitzer, publisher of AdHouse Books. "I think it is a win for everyone involved from the creators, to the publisher, to the distributor, to the retailer and ultimately, to the comic reader." If you've got your hands on this year's hottest new smartphone, you'll want the book that covers it inside and out: Palm Pre: The Missing Manual (O'Reilly Media, $24.99). This beautiful, full-color book from USA Today personal-technology columnist Ed Baig will help you go from newcomer to expert in no time. The maker of the legendary Palm Pilot is back on center stage with a smartphone that lets you browse the Web, listen to music, watch video, view pictures, and a lot more. Where the phone really excels is as a heavy-duty mobile computer. Like "iPhone: The Missing Manual, this book features the clarity, wit, and in-depth coverage that's made bestsellers of so many titles in this series. Palm Pre: The Missing Manual provides you with everything you need to know to get the most out of this amazing mobile tool. Your Programs, All in One Place. Say hello to a phone that multitasks as well as you do: Browse the Web, read and answer email, schedule appointments, and take pictures as fast as your fingers can fly. Navigation, Finger-style. Master the Pre's finger gestures and learn how its application "cards" let you flick between programs. The Web, Always On. IM with friends, read emails the moment they arrive, and watch web pages update on the fly (latest sports scores, anyone?). Your Life, Integrated. Say good-bye to flipping between work and home calendars, emails, and contacts. The Pre weaves all this info together in real time. Learn how to get the most out of this timesaving-and life-changing-feature. Ed Baig writes the weekly Personal Tech column in USA Today's Money section (and at usatoday.com). He's also cohost of the paper's Talking Tech podcast and the author of the latest edition of Macs For Dummies. PR: This is a very innovative design, it gives your a Dual SIM for your iPhone 3G/iPhone 3GS as well as a battery with an internal USB Cable with controller for Pure Charging or Charge + HotSync for your iPhone 3G/iPhone 3GS. With this External battery, you are no longer to hassle with your network problems when you are traveling from one country to another country. Note once you've chosen to another SIM card, it will have a message "No SIM Card installed", please wait 1 or 2 minutes, it needs around 1 ~ 2 minutes to search, during this time, "No SIM" will appear in the top right of your iPhone's screen. When the battery is with the case, the LED will be always on (blue). When the battery is being charging, it will be in Red. For sync with PC/charge with PC/Mac, please turn the Charge Button to "OFF"
This devices does NOT support Dual STANDBY Mode but you can switch between them. Due to complexity of network compatibility, we cannot 100% guarantee its compatibility with your network, we can only guarantee the compatibility of the battery part, but if you have problems of compatibility, we will try our best to help you. This battery is more or less same as another product that we have, just that it does NOT have Dual SIM Function. PR: With Novothink's hybrid solar charger case, you can now power up your iPod literally anywhere under the sun. Our solar panel technology enables you to be part of the solar energy solution. Harness power directly from the sun while carrying your iPod touch. 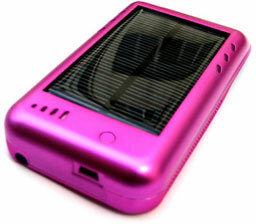 This sleek, smartly designed hybrid solar charger is designed for the iPod touch user on the go. Solar energy is a well tested power source that is already being used around the world for numerous commercial, industrial, government and domestic applications. It is powering water pumps in African villages, weather stations in the Antarctic and satellites in space! It works by transforming the energy from the sun into a reusable form of electricity, a process known as Photovoltaic (or PV for short). Your solar panel acts as a collecting tray, helping you catch the sun's rays. The bigger the panel, the more energy you can collect. The energy collected is stored for your future use in a battery. Clean and green, solar power is a renewable, sustainable and nonpolluting source of energy. It is easy to see the appeal of solar power for domestic use. Low maintenance and long lasting, it is a highly cost-effective and reliable energy supply. The Surge features an internal battery which your iPod touch draws on when needed. The integrated solar panel will charge the internal battery, provided sufficient light is available. For times when adequate light is not available or when you just need a quicker charge, the USB port offers a fallback option. What exactly does the Surge do? How does it work? The Surge uses a solar panel to collect sunlight, which it turns into electricity. If your iPod touch is not fully charged, it transfers the charge to your iPod touch. When your iPod touch is fully charged (or when it is not inserted), the Surge transfers the charge to its internal battery. The charge from this reserve battery will transfer to your iPod touch's battery as necessary. What are the four (4) LEDs for? The built-in LED lights let you know whether you have sufficient light source for solar charging and approximately how much charge level remains in your charger. Please note that percentages indicated below are approximate and that fewer LED lights will light up when the iPod touch is inserted into the charger. The first button will light up RED anytime the charger is exposed to sufficient light and is solar charging your Surge. Indicates that your Surge is charging by Sunlight or USB cable. Charge level is about 25% and light source is too dim or not available. USB charging is recommended. Charge level is about 50% and light source is too dim or not available. Charge level is about 75% and the light source is too dim or not available. The Surge is fully charged. Please note: You will only see this light combination when the iPod is not inserted in the Surge. When you insert your iPod into the fully charged Surge, only three bars will light up as the Surge gives power back to your iPod. To see the charge on your iPod touch battery, refer to your iPod touch. How can I charge my iPod touch? You can charge your iPod touch by allowing the sun to do the work or you can use the included USB cord to hook the Surge up to your computer. You never need to remove your iPod touch from the case to charge it! The lines on my solar panel are unevenly spaced. Is it defective? No, your solar panel is not defective, nor is it less efficient. Unevenly spaced lines on the solar panel are a common occurrence and don't affect efficiency in any way. Can you give me an idea about how long I need to keep the Surge in the sun to be able to continue using my iPod touch? Certainly! Check out our Solar Planner to get an estimate of how long you would need to keep your Surge in sunlight to keep it charged over a number of days. This doesn't take into account charging via USB. Can I use the Surge with my first generation iPod touch? No, the Surge is designed for the size, contour, and hardware of the second generation iPod touch. Can I sync with iTunes without removing my iPod touch from the case? Is it easy to remove my iPod touch from the Surge? Simple! Place your thumbs (please refer to the illustrations to the left) on the lower section of your iPod touch and gently push forward to remove it from the Solar Charger case. The solar panel on my Surge is becoming scratched. Is this normal? Yes, scratches will accrue over time but won't affect solar charging functions. We recommend that if you need to dust off or clean your solar panel, that you use a soft cotton cloth, lightly dampened with water. What makes the Surge a smart solar charging device? Our smart solar charger automatically charges your iPod touch whenever it needs "juice" and there is sufficient power reserved in our charger. You do not need to think about it, and there are no switches to worry about: just insert your iPod touch, and our charger will know when to start and stop charging to maximize running of your iPod touch. Our smart solar charger has also a built-in thermal sensor, which will stop charging to prevent your iPod touch and your charger from overheating. Of course, use your common sense and don't leave your iPod touch on a dashboard in extremely hot weather as this could damage your iPod touch and even the charger, although our charger withstands higher temperatures than the iPod touch. "Today we will be looking at the first of two cases sent to us by Sena who are known for their leather cases for mobile devices such as Palms, Blackberries and of course iPhones. After reviewing a slew of plastic and silicon cases it is nice to wrap my iPhone in a quality leather case. "First up for review is the Apple iPhone 3G/3GS Leatherskin Case. It is designed to be form fitting while protecting the iPhone from scratches. Composed of European Napa leather it will last for a long time while keeping its appearance. "The Apple iPhone 3G/3GS Leatherskin Case comes in a burgundy red box with the Sena logo [and] in fourteen colors/variations. They offer three 'croc' style offers in black, red and tan. We received the Croco Tan style." PR: Marware Inc., designer and manufacturer of innovative products for the Apple market, today announced the MicroShell for the iPhone 3G/3GS is now shipping. The MicroShell provides protection without adding any bulk to the iPhone. 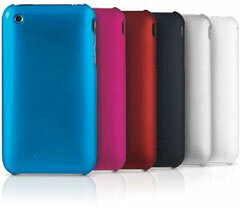 This sleek, ultra-slim half shell case is perfect for protecting the iPhone in a pocket, purse or bag. The MicroShell works as an additional layer of sturdy protection when used in conjunction with most fabric style carrying solutions, like the Marware CEO Premiere. The MicroShell is available in six eye-catching colors and a clear version. The colors include black, red, blue, pink, white and silver. The MicroShell also comes with Marware's Lifetime Warranty. The MicroShell is available black, clear, red, blue, pink, white and silver. It retails for $29.99 and is now shipping. Please visit www.marware.com for more information on the MicroShell and other Apple accessories. Marware is a leading provider of software and accessory solutions for Apple iPhones, iPods, and Notebooks. PR: iPhone CAZE today announced Swarovski crystal cases, a premium version of its Mirror Go and Love Pair for iPhone 3G and 3GS. Mirror Go and Love Pair are the flagship products of iPhone CAZE, featuring a shinny Mirror-liked surface and a matte surface. Its Premium version adds more than 40 Swarovski crystals around the Apple logo of the case. 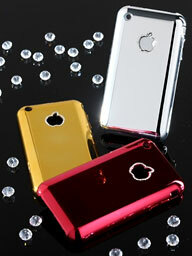 Combined with the Free Swarovski Apple logo, the Premium versions will give a shine and uniqueness to your iPhone 3G/3GS. Other than Swarovski series, CAZE also offers other stylish iphone cases such as Silver Tone of its metallic series, D Strip and Slim Fit. iPhone CAZE designs and manufactures high quality, fashionable and unique iPhone cases for iPhone 3G/3GS in a wide assortment of styles and colors. The materials that they used for making the cases including leather, metallic, fabric, silicone and Swarovski crystal. An extra iPhone case (value $20 or above) or a Swarovski Crystal Apple logo (value $20). The value of all these gifts worth $35. All the cases are examined carefully and packed in a gift box for shipment. Products will be shipped within 24 hours during weekday. Free shipment and online order tracking are available. 30 Days Money Back Guarantee is provided. PR: This elegant Swarovski Apple logo adds a touch of glamour and sparkle to your iPhone 3G/3GS (also available for MacBook at US$99). 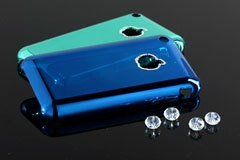 Want to bling your iPhone without a Swarovski crystal iPhone case? This is your choice. Handmade and unique in the market.